NEW YORK, New York, April 4, 2012 (ENS) – Is it a roadable aircraft or a flying car? It’s both and it’s coming to the New York International Auto Show opening to the public April 6. Developed by Terrafugia, Inc., the Transition® Street-Legal Airplane is a two seat personal aircraft capable of driving on roads and highways at up to 100 mph, parking in a single car garage, and flying with unleaded automotive fuel. The Transition proof of concept has been tested as safely achieving speeds around 100 miles per hour on the ground. The Transition is now an important flight closer to being a commercial reality after the production prototype had a successful first flight on March 23 at Plattsburgh International Airport in Plattsburgh, New York. “The successful first flight of this Production Prototype Transition marks a critical move toward initial production and first delivery,” said Terrafugia chief operating officer Anna Mracek Dietrich. 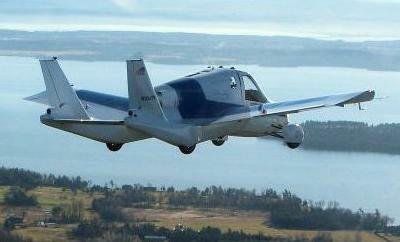 Terrafugia (terra-FOO-gee-ah), based near Boston in Woburn, Massachusetts, is a privately-owned aerospace company founded in 2006 by pilots and engineers from the Massachusetts Institute of Technology – award-winning MIT-trained aeronautical engineers and MBAs – who also happen to be passionate private pilots. The company name is Latin for “Escape the Earth.” Terrafugia’s mission is to design and deliver revolutionary, practical air and land vehicles that provide freedom, flexibility and fun. Taking advantage of new federal regulations in the Light Sport Aircraft category, Terrafugia developed the Transition Roadable Aircraft to provide pilots the convenience of a dual-purpose vehicle. The Transition’s first flight reached an altitude of 1,400 feet above the ground and lasted eight minutes while staying in the vicinity of Plattsburgh. It demonstrated the controllability and safe operational characteristics of the aircraft. Six phases of flight testing are planned to continue development and demonstrate compliance with the Light Sport Aircraft standards.